By completing the steps below you will be able to allow PSS to access pricing/inventory for OEM Parts/Accessories and OEM Units. You will need to contact your Lightspeed representative to have them activate. Enter your credentials per the below fields in yellow. Once you complete the above you will need to input your Supplier Codes for each OEM. 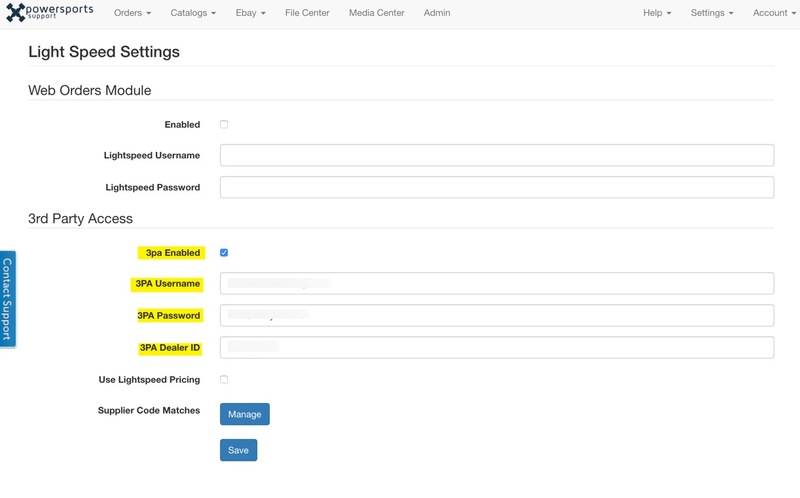 This is done by clicking on the "Manage" button next to Supplier Code Matches and then adding the codes that are unique to your Lightspeed account. Note: To use Light Speed for both Inventory and Pricing you will want to check the "Use Lightspeed Pricing" box.